11/6/2013 - I couldn't find anything in Gatherer that suggests this card has already been made, so if you do, please share. If not, I humbly submit this Unsummon variant as something I'd like to see printed not just once. The only one that comes to mind that is close is Orzhov Charm. 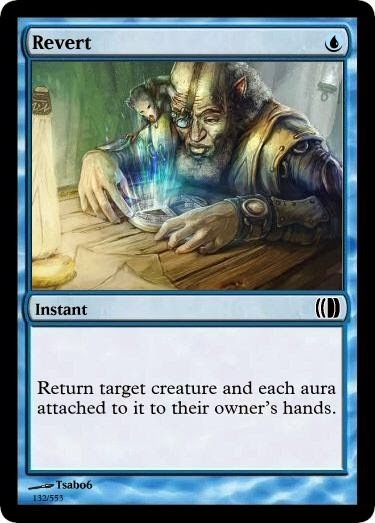 The spell is fine; it would be interesting in THS because the aura clause might actually make it better in limited sometimes when you get to bounce the bestow creature rather than leave it on the battlefield. Otherwise, I don't think it is very "interesting" but it is a fine card. Mark of Eviction from original Ravnica comes to mind. Thanks. I knew there was something close, but couldn't put my finger on it. Looks like Word of Undoing is similar too. All of these lead me to believe even more than Revert is a nice common version. I really like this. I've long hated the aura/unsummon interaction from a design standpoint. It makes blue good against something blue has no business being good against, and totally hoses new players for doing something they want to do. Revert is a nice step towards that. My one concern (and I don't think there is an elegant fix to this) is that this still efficiently blows out auras as they are being cast. This wouldn't be so bad if it was a Sorcery would it? This is smooth. Very nice for Theros in particular. Yep, this should exist, and probably will at some point.